Mayo, FL--A large crowd of Fellow Travelers, including several rookies, met at Ezell Landing for the annual Memorial Day weekend trip. The trip was scheduled on Sunday rather than Saturday in order to accommodate the Moyes and the Lippys who were to be at the Florida Folk Festival telling lies and playing dulcimers, but the wildfires canceled the festival. In spite of that, the Lippys and Moyes declined the opportun ity. George Royal brought his daughters, Melissa and Kathy, for their maiden voyage. Edwin McCook brought his rookie friend, John Vassar. Paula Allen came with Jamie Simpson, another rookie. Hamp Chauncey was there. Jerry and Donna Ellis brought their kayaks. Daniel Butler also kayaked. John Williams camped at Lafayette Blue Springs and came along. Charlie Stines brought Jim Shamp, Sally Shamp, and son Jac from Cheney, Washington to introduce Sally and Jac to the group. Charlie also brought Tamara Benton and first-timer Jim Ansari. Charlie also brought Diane’s Yorkie, Ami, so he would h ave some company in the canoe. Ami is not a rookie having made a previous day trip. While the shuttle was being done several of the paddlers crossed the river to visit Charles Spring. It was very low but Tamara did get to wade in the cool water. After shuttling the cars to the Peacock Slough campsite, everyone was ready to paddle the river. The river was very low and the springs were low but clear. The weather was lovely. It is a rather short paddle from Ezell Landing to Lafayette Blue Springs State Park (Yana Springs) but it was a scenic paddle. Although the water was too low to attempt paddling up Allen Millpond run Daniel did stop there and got some pretty pictures. The stop at Yana was an early highlight. Several of the paddlers took time for a swim or to play in the clear waters. Since it was a holiday weekend there were more than the usual number of people at the park. Once the swimming was d one everyone ate their lunch snacks and proceeded onward. The next stop was to be at Perry Springs. It was a nice float there, and turtles and birds amused the gang. There were a few sturgeon spotted as they performed their aquatic acrobatics. Perry Springs was low, but again some tried out the swimming. The sandbag dam at the spring has been removed and that is an improvement. O nce the break was done the flotilla headed downstream toward the Adams Bridge at SR 51. The low water just above the bridge gave the best paddling thrill of the trip. Everyone successfully negotiated Florida’s version of whitewater but water came over the sides of several canoes. There was not a stop at the SR 51 landing because the anticipation was to break at Telford Spring. Unfortunately for the travelers, there was a huge family reunion and more people than at a football game, so the decision was made to pass the noisy group. Everyone arrived at the Peacock Slough camp before three. The camp is brand new and is a showpiece. Sue Dudley, the campground hostess, met us and was a very nice person. A few set up tents but most elected to sleep under the ceiling fans of the screened camping platforms. Several took advantage of the hot showers but some remained dirty. Several others joined the group at the campsite. Greg Baker and Frank Sutton (the Jester) joined the group for supper, as did Art Shelfer, Mark Mitchell, and Margie Massey. The Weatherman and the King prepared two turkey friers full of low-country shrimp boil. It was all eaten. The campground hostess ate with the travelers. After supper Frank treated everyone to the monkey story. A few thought he was lying. A few other lies were told, but none matched Frank’s tale. It was a time to show off new rides. Hamp brought his brand-new Subaru Baja. Art displayed his newly-painted Benz. John Williams drove his red diesel Suburban. Charlie displayed his new Expedition EL. (A retirement party for the Suburban Profane had been planned, but due to the fact that Diane could not come and drive the Expedition, Charlie brought it instead of the Suburban.) But the star of the new rides was Greg’s Ural motorcycle complete with sidecar. The Ural is essentially a modernized World War II B MW used by the Nazis. The Mayor was kind enough to offer sidecar rides, and a few took him up on it. After supper Greg and Frank left to spend the night at nearby Riversong. Paula and Jamie, and Edwin and John Vassar also ate and ran. Everyone slept well, but Ami stood guard and proved that a little dog can make a big noise. She barked every time a squirrel or anything else stirred. Art made breakfast for everyone. It was a hash of eggs, sausage, potatoes, and whatever else Jimmy Dean puts into his breakfast treat. Charlie made fifty cups of coffee in the electric urn, and it ran dry. Margie provided some fruit. Donna and Jerry had to leave after breakfast. After breaking cam p and loading the vehicles the shuttle was run to the take-out at Royal Springs. Once done, the canoes were manned and the final day’s trip began. Margie, Mark, and Art paddled this time. Despite his previous comic performance, Mark kept the canoe relatively straight with assistance from Art. The river and its banks were beautiful. The first stop was at Running Springs. Posted signs were not in view. 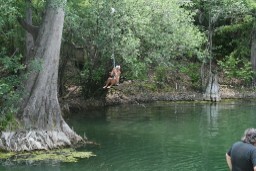 Jac especially enjoyed the rope swing, but others enjoyed the cold water. Melissa and Kathy were among those testing the water. After leaving Running Springs and passing the old trestle, the paddlers proceeded to Bathtub Spring. The main spring was almost dry but the surrounding springs were clear and very blue. Margie wanted to find the old graveyard but did not locate it. 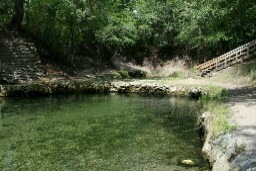 The next stop was to be at Convict Spring and River Rendezvous. The plan was to eat lunch the restaurant but everything was closed, probably due to the low water. Ne vertheless, there were sufficient supplies of sardines, Vienna sausages, crackers, and other goodies to feed the hungry crew. The spring was very low and the spring run was a grassy trail rather than a canoeable stream. From there the journey to take out was undertaken, There were some divers in the area and there were a few jet skis. The low water exposed lots of rocks and the boaters had to be careful not to hang on the rocks. 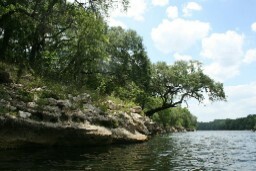 It was a scenic paddle, though, despite the considerable development along this stretch of the Suwannee. Once the boats were loaded, everyone said fond good-byes and agreed it had been a marvelous trip. Charlie, Tamara, Jim Ansari, and the Shamps loaded into the Exhibition and hoped to make it home without the trailer giving trouble. After passing through Quitman and being about twenty-six miles from Moultrie the sound of metal scraping pavement alerted everyone. The frame was dragging. Jac stayed with the trailer and everyone else in the car drove to Moultrie. Once there, Tamara and Jim left for home, Sally stayed in Moultrie, and Jim and Charlie took the Suburban Profane, a sawzall, some c-clamps, and some straps to try to rescue the trailer. Since the Suburban had canoe racks, it could carry the boats two at a time to Moultrie. (The rack for the Exhibition arrived the following day!) After two trips the canoes were back. Jac used his expertise in cutting a hole in the trailer bed, using straps to hold up the frame, and using c-clamps to hold some of it. The trailer was brought back safely and slowly. Once home, everything was rather normal. The following Wednesday Charlie took the trailer to the Jester who will repair it. Meanwhile, the Yakima rack will be installed on the Exhibition. The Suburban Profane will get some rest.